There's no doubt that Mexico has become a pretty rough place to live, in the past couple of decades. The crime rate is astronomical. According to the demographics site Nation Master, Mexico ranks in the top five nations in the world for homicides and violence committed by youths. They are #3 for number of prisoners per capita, and have a wealth gap that staggers the imagination -- 16% of the citizens of Mexico earn less than a dollar a day. Corruption is rampant, the drug cartels are in charge of many cities, and the air and water pollution, especially in Mexico City, result in thousands of preventable deaths per year. So all of those problems, what do you do? You have a mass exorcism, that's what. Because clearly what's doing all of this awful stuff is... demons. At least that's what Cardinal Juan Sandoval Íñiguez, Archbishop Emeritus of Guadalajara, and his sidekick, Spanish priest and exorcist Father José Antonio Fortea, think. With the permission of the Archbishop of San Luis Potosí, Jesús Carlos Cabrero, the "Grand Exorcism" was held in the Cathedral of San Luis a couple of weeks ago. "This celebration is a sacramental [sic] of the Church,," Cabrero said. "During the ritual, some priests were present, and Cardinal [Sandoval] did me the favor of accompanying us, in response to an invitation I sent him." The ceremony was conducted in private, Cabrero added, because otherwise, "morbid interests appear, and misinterpretations." Hey, you're the one who thinks that demons are running rampant in your country, harming and killing innocent people. How much more morbid can you get? Cardinal Sandoval, however, was in full support of the event. "The Great Exorcism is a prayer asking God to drive away the Enemy, to drive him away from these places. From San Luis, first of all, and then from all of Mexico. People should become aware of the very grave situation we are living through in Mexico, whose root is very deep, beyond human malevolence; it is the devil, who is very connected to death. He is a murderer from the beginning... Acts of revenge, now occurring between assassins and the government; deaths here, deaths there, and deaths everywhere. This violence is nothing else but the Devil who is tearing us apart." As far as how they know all of this, apparently they found out from one of the demons itself. Roberto O'Farrill, a Catholic journalist and "demon specialist," said that during an exorcism of a devil from a guy named Ángel (I'm not making this up), the demon kind of spilled his guts regarding what is going on. O'Farrill explained that "the demons possessing Ángel said, 'you are stupid, because She [the Virgin Mary] cast us out of Mexico, and now you with your stupid laws have allowed sacrifices to return to Mexico, human sacrifices. We don't want to say this but She is stepping on our head and forces us to.'" "During that exorcism," O'Farrill added, "the Virgin Mary forces the demons to say that they have returned to Mexico, that there is once again an infestation, principally in Mexico City and in other parts of the country." Well, that's proof enough for me. 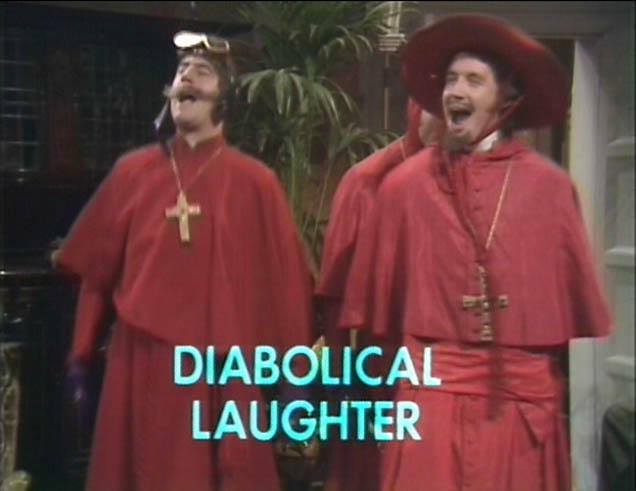 Time to reboot the Inquisition, sounds like. Okay, nothing much has changed. In fact, just last week, a bunch of "radical teachers" in the town of Tuxtla Gutierrez went on a rampage, and attacked and burned the headquarters of five different political parties, demanding, amongst other things, "100% pay raises." A few days before that, 42 suspected drug dealers who had taken over a ranch in the state of Michoacán were killed in "sprays of machine gun fire" by police. Violence has recently spiked in Tijuana during the lead-up to elections on June 7, with gang and drug related killings reaching record numbers, and including such grotesque horrors as "severed heads in an icebox." So yeah, Cardinal Sandoval really seems to have those demons on the run. But we can't have reality intruding on the worldview, after all. Bad for business, in one of the most staunchly Catholic countries in the world. Gotta keep having meaningless rituals so they can pretend they're actually accomplishing something, rather than throwing their accumulated wealth and resources behind things like remediating the crashing poverty and hiring more law enforcement. And, of course, dealing with all of the "radical teachers." Those sonsabitches are mean.